URBANA, Ill. – Farmers and anglers in Cambodia depend on the Mekong River's predictable seasonal patterns, but new dams for hydroelectricity are altering the hydrology of the river. These changes have the potential to threaten fish migration, livelihoods, and regional food security. A new paper from the University of Illinois and Iowa State University urges a participatory approach for managing the Mekong River basin that engages local residents who have deep knowledge of the river. This local knowledge, combined with technical and scientific findings, is important for developing effective strategies to adapt to the changing flows and uses of the river. "Due to years of civil wars that destroyed infrastructure and hindered modernization, only a little more than half of the Cambodian population has access to electricity. Hydropower is a critical building block for needed modernization. However, using the water resources for power presents difficult trade-offs for fishers and farmers," explains Kenneth Olson, professor emeritus in the Department of Natural Resources and Environmental Sciences at U of I and co-author of the article. 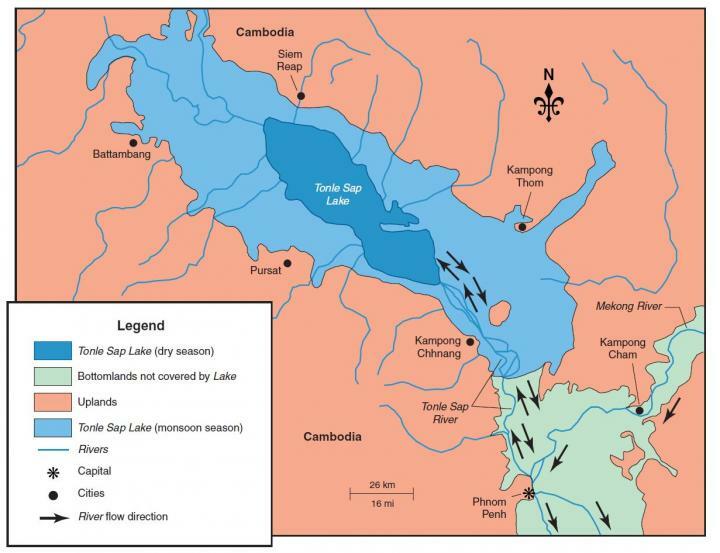 In the article, Olson and co-author Lois Wright Morton detail the geology and soils of the Mekong River and Tonle Sap Lake and River area, which dominate the Cambodian landscape. The Tonle Sap River is a tributary of the Mekong River, connecting it with Tonle Sap Lake northwest of Phnom Penh, the capital of Cambodia. "This unique, complex hydrological system is strongly influenced by the Asian monsoon. During the monsoon season, the Tonle Sap Lake surface area enlarges to become four times greater than in the dry season and hold nine times more water by volume. The surface water level can change by more than 30 feet, so homes are either in floating villages or on stilts," Olson explains. This phenomenon occurs because the Mekong River begins to flood in May and June and backs up into the Tonle Sap River and Lake. The rains stop in November, and as the Mekong River water levels begin to drop, the Tonle Sap River flow reverses and again becomes a tributary of the Mekong River. Thus, the Tonle Sap River flows northwest into the lake for six months a year and then reverses and flows into the Mekong River for the other six months. "The flooding brings needed sediments and nutrients for crops and fishing, but an increase in sedimentation has the potential to shut down dry-season navigation between the capital and regional centers by making the already shallow lake even more shallow over time," Olson says. There are currently plans to build 11 more dams on the main stem of the lower Mekong River. River ecology scientists and environmentalists, including Olson and Wright, are concerned about how these dams will affect the historically predictable downstream flows and seasonal flood patterns to which birds, fish, and plant communities have adapted over time. Specifically, fish migration is a huge concern. "Cambodia is dependent on fish for high-quality protein and food security," Olson says. One dam being built, named the Lower Se San 2, will block fish migration between the Se San and the Mekong and will flood homes behind the dam, according the authors. "The tradeoffs among hydroelectricity production, food security, and fisheries' livelihoods are difficult and complex, and developing an integrated resource management plan is not an easy task. Broad participatory approaches that include local residents in the scientific and technical information exchanges can improve decision-making and better meet government, industry, and rural communities' goals. Fishers and farmers can continue to successfully adapt if given opportunity, resources, and tools. These issues don't just affect Cambodia; they impact the food security of urban people throughout Southeast Asia," Olson warns. The paper, "Tonle Sap Lake and River and confluence with the Mekong River in Cambodia," is published in the Journal of Soil and Water Conservation [DOI: 10.2489/jswc.73.3.60A]. It is a companion article to a paper on Lao dams on the Mekong River. Financial support for the project was provided by the College of Agricultural, Consumer and Environmental Sciences at U of I and the College of Agriculture and Life Sciences at Iowa State.